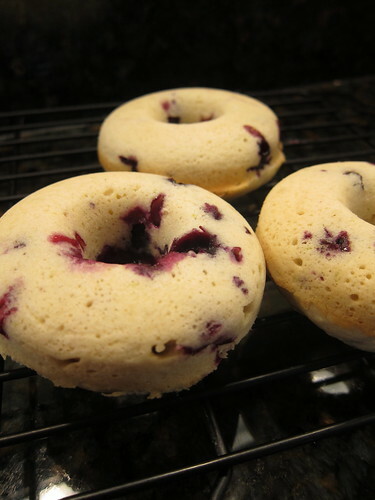 Since I got my donut pan I've been thinking about making blueberry donuts. It's been so hot though I haven't wanted to turn on the oven even for a little bit. Yesterday though, the heat and humidity dropped, so I had my chance. 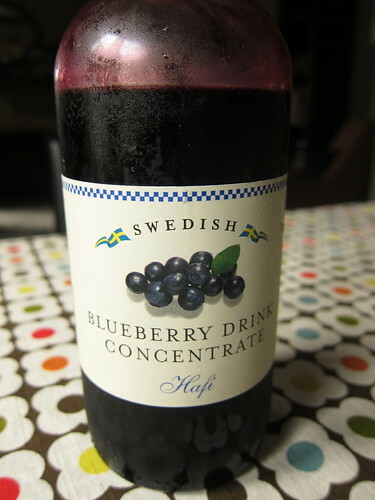 The thing that got me thinking about blueberry donuts was this Swedish Blueberry Drink Concentrate I had picked up at Ikea. We'd used it to make blueberry soda in our Soda Stream and have ideas for cocktails, but I thought it might be a good baking ingredient too. I went back and forth about whether to make a citrus donut with blueberry glaze or a blueberry donut with a citrus glaze. 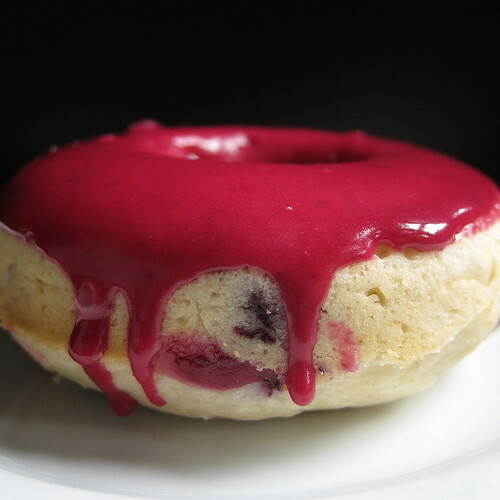 Since I had fresh blueberry from the farmers market I thought I'd mix it up and put whole blueberries in a citrus donut with a blueberry glaze. I would say the results are about 80% there. The donut tasted lot like a blueberry muffin, though it was a little denser. Matt really liked them. One of them had way too many blueberries in it and sort of fell apart. I was planning on doing lemon as my citrus, but had a lime in the fridge so went with that. It was a little old, so the zest was kind of dried out and didn't give the flavor kick I had hoped for. The glaze was stunning, but watch out that blueberry concentrate will stain anything! I share the recipe as I made it as a starting point for someone else who might be interested in trying it or improving on it. Preheat oven to 325F. Lightly grease three mold in a donut pan. In a small bowl stir to together the flour, sugar, baking powder and salt. Add in the lime zest, lime juice, 2 tablespoons of milk, vanilla, egg and shortening. Combine until just blended. If it seems dry add the rest of the milk. Fold in the blueberries. Fill the donut molds about 3/4 full. Bake for 11 - 15 minutes or until a toothpick inserted into a donut comes out clean (They will probably cook quicker if you use fresh instead of frozen blueberries). Let cool in the pan for a few minutes and then move to a rack to finish cooling. Mix the powdered sugar and blueberry concentrate together until smooth in a shallow bowl. Dip the cooled donuts in the glaze. Put back on the rack for a few minutes to let the glaze dry. I recommend putting a paper towel or something until the rack to catch the drips of glaze. The combination sounds fabulous. Even at 80%, they look amazing!! Maybe mashing the blueberries and stirring in. It would be less concentrated on some of them. I love blueberry donuts, they are one of my favs. The next time I am at Ikea I am so getting that concentrate. Beautiful! I'm trying to reproduce an old country syrup that's similar to your syrup. Now I'm inspired. The glaze sounds magnificent! Worth a stain or two. Are these as hot pink as they look? They look amazing, and I love the flavor combination. Thanks for sharing! lwbookeater - the frosting is totally that hot color! Oh wow, I can take 80% with these. They look beautiful. I completely understand trying to get a recipe to it's fullest potential though. I'd say 100% on appearance.